The Natural History Museum Balancing Pteranodon is one of our favoured toys. We have had a lot of fun with it. It appears to defy gravity and magically balance on fingers, table edges, sticks, desks and more. It even balances on noses. I know this as The Child tried to balance it on my nose once when I was still asleep. That was a strange way to wake up with a Pteranodon staring you in the face. 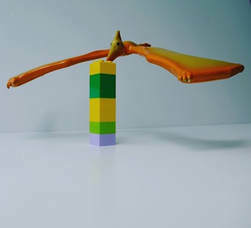 This works through the Pteranodon being weighted in the front of the wings so that the centre of mass is below the beak, meaning that it will stay balanced on your finger or similar. Robust, educational and fun, this get a big tick from me and a big tick from The Child.